The fabrics are absolutely beautiful! They’re full of vibrant, cheerful colors and bold designs. I wanted to work all the fabrics into one wall hanging, but what a challenge to blend such strong patterns together! And the wax prints are lighter and more delicate than the quilting cottons I’m used to working with, which only makes sense coming from their warmer climate. Frankly, I worried that the fabrics just weren’t strong enough and that so many “personalities” of prints just couldn’t work well together. Then realized with a stronger, more stable start, this could really work. 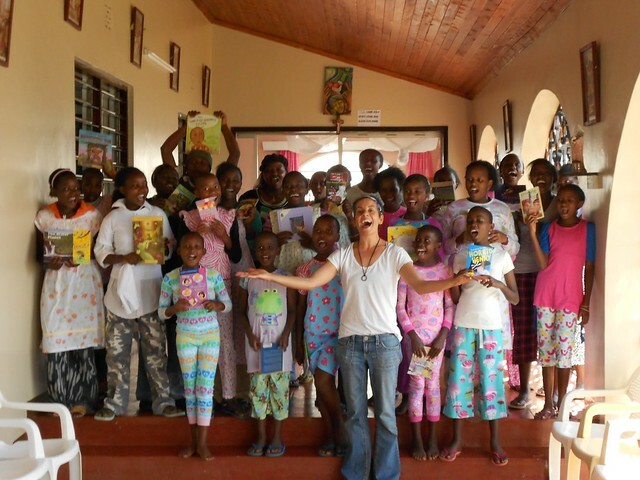 The fabrics just needed a good home base and a little room to shine, just like the girls at St. Monica’s. Each circle is from the African wax print fabrics Rocky bought in the open air markets of Kenya, and they’re appliqued onto a batik fabric square I purchased here. 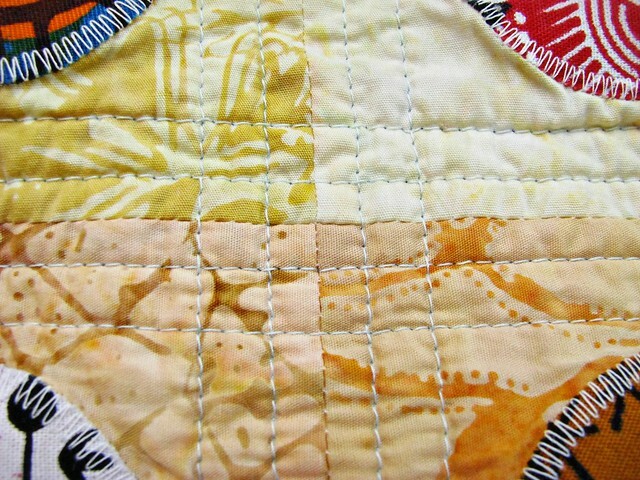 The squares are arranged so that in the background you’ll see an outline of Africa, with the warm oranges and yellows of the land in the blue batik sea. The batik fabric provides strength to the African wax prints and gives the restful space each fabric needs to stand on its own. Can you see the continent? With a closer look, you’ll also see sturdy double rows of pale blue quilting following each seam. This makes for an especially strong little quilt. I hope this wall hanging quilt will serve as a reminder that the strong base of an education and the loving home provided at St. Monica’s will give each of these girls what they need to grow, prosper and shine. 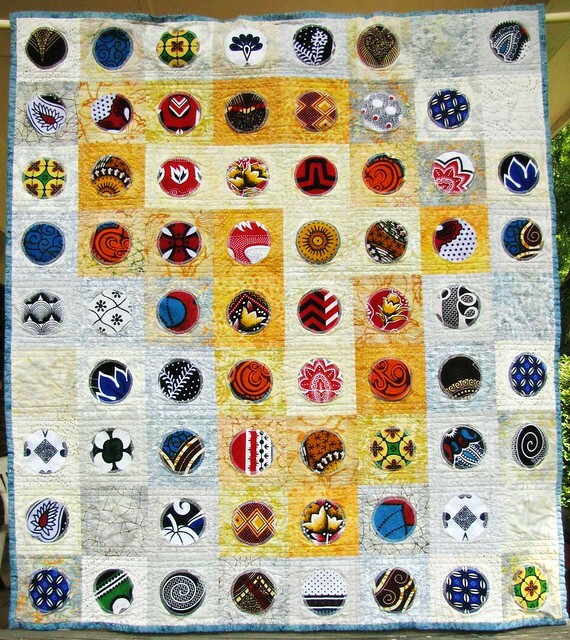 The Africa quilt will be auctioned November 3, 2012, to raise funds for the Gift of Education. 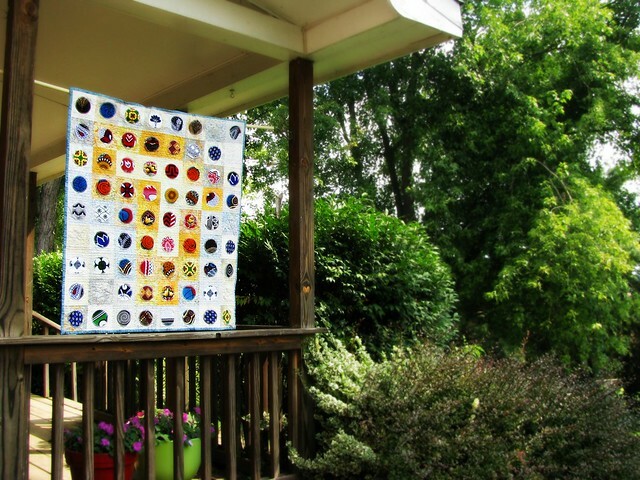 It measures approximately 35.5″ x 40″ and has a rod pocket on the back for hanging. Please let me know if you have any questions about it! Thank you, Rocky! :) I hope it’s a help at the auction! 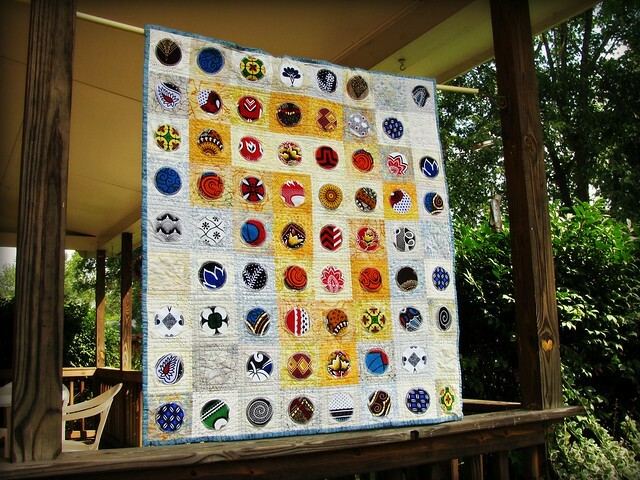 Sarah, Thanks so much for sharing this quilt. You did a beautiful job. I bet it’s really even more beautiful in person. It’s beautiful, Sarah! I think the layout is so creative. Wow this is seriously incredible! 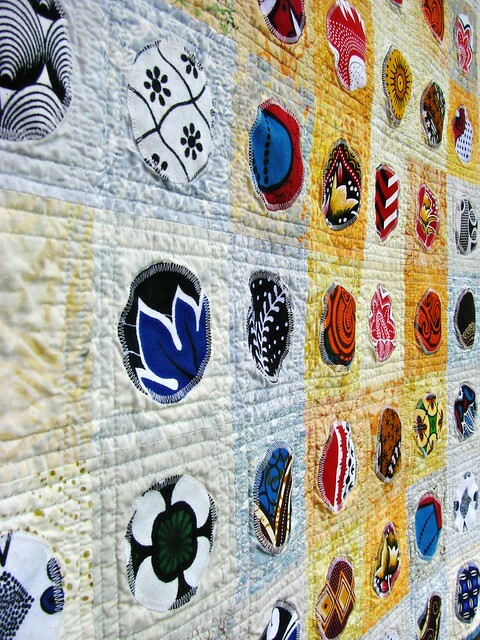 I made two wax print quilts in the past year and faced the same challenge of how to blend them in a cohesive way. I really how how you incorporated low volume fabrics and the subtle continent shape – genius! If you feel like checking mine out you can find one on the ‘2013 Quilts’ tab and one on the ‘Quilty WiPs’ tab (the second if my favourite ;) Thank you so much for sharing this!